Blitz Facial Bar wants to give your skincare routine relaxation and hydration in half the time of a regular facial, and half the price. 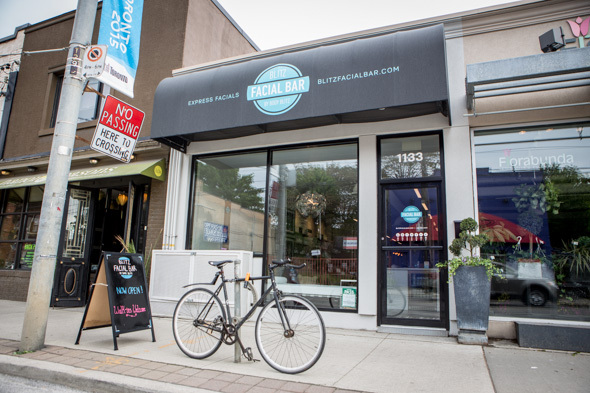 Now open in two locations, Leslieville and Queen Street West, the new facial bar focuses on the essentials of a good facial with faster treatments than what's offered as part of the Body Blitz spa experience. My skincare routine consists of only three products. A good all-natural face soap, a morning moisturizer purchased from Saudade in Little Portugal, and a healthy heap of coconut oil at night. Apparently I don't need more, as Crystal, my aesthetician for the day exclaimed that I had really good skin. She could have been saying that as a nice gesture to me, but, regardless the entire treatment made me feel great about my skin. I received the Blitz + Glow facial, and felt skeptical the treatment would only take 30 minutes, but was surprised to see that from start to finish I had been at Blitz for about 40 minutes. It starts with a nice greeting at the front desk, and then filling out your health history. Your aesthetician goes over any skincare concerns, and then the treatment begins. You'll get the typical up-sell of additional boosters, which I decided to opt out of, since I'm not too fussy about putting extra on my face. When the facial is done, the aesthetician writes out a "prescription pad" with suggestions for products to use at home (from the Body Blitz line, of course) and what additional services you can get the next time you come in. All products used are from Body Blitz's own eco-friendly line. My treatment started with a good cleanser, exfoliator, toner and a clay mask that is left on for five minutes and then taken off with a hot towel. There's also a relaxing face, arm and hand massage and the treatment ends with a peppermint scent swiped under your nose. My face felt noticeably soft afterwards, and had the unmistakable glow that comes when your face has been properly pampered, instead of a lazy five-minute wash-and-go home routine. The Blitz facial bar feels like it should be a relaxing spa, but it's more like a classy hair salon with chairs closely aligned together. There are no private rooms, robes or gentle music playing in the background. The aim is to get your face looking as good as possible as quickly as possible. Laura Polley, the CEO of Blitz Body Spa says women appreciate the express facial because it's in their price point and doesn't take up half their day. You're not really going for the atmosphere, because at the facial spa the focus has been put on the basics of a facial. Body Blitz facial spa does offer high end microdermabrasion and boosters (additions to your facial package) like vitamin C mask, enzyme peel and plumping serums. The Blitz Facial menu has four options, with three taking only 30 minutes. The Blitz + Glow ($48) is perfect for monthly maintenance or a quick glow, The Extractor (add extraction for $58), The Micro ($78), an express microdermabrasion facial and The Works ($118) takes an hour which includes the classic Blitz + Glow, extraction, microdermabrasion and a facial lymphatic massage. 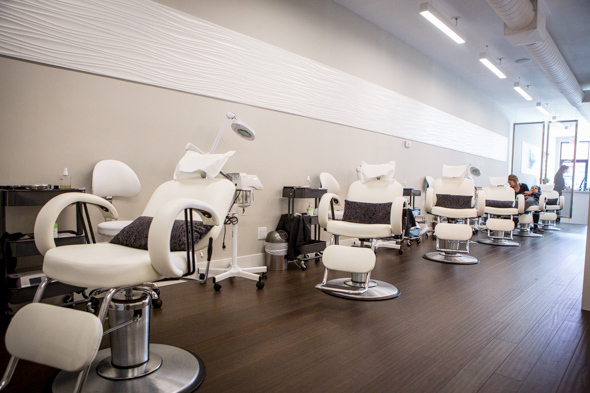 If you're in a wedding party, or the bride and groom, Body Blitz offers a six month facial program, working with an aesthetician to carve out a custom monthly facial plan. After spending 10 years offering therapeutic and communal waters to women with Body Blitz Spa and opening a second location on King East , Polley says it felt like a natural progression to go from looking after the body to looking after the face. 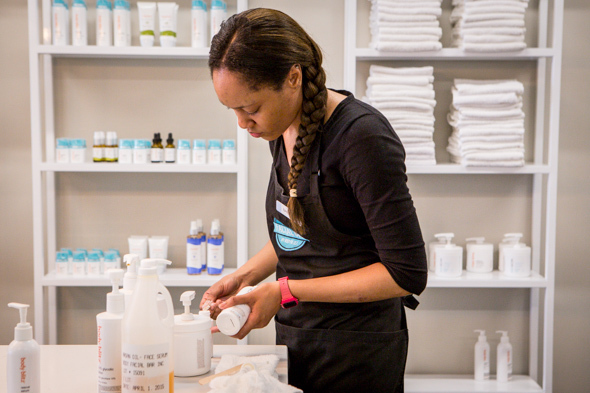 "Women and men often think of facials as a treat or indulgence, and like body blitz, we wanted to make it quick and easy and encourage them to incorporate it into their healthy lifestyle," says Polley. And while the blitz waters are exclusive to women, the blitz facials are not. "I think men are beginning to realize how important it is to look after themselves and to be proactive in maintaining healthy skin." 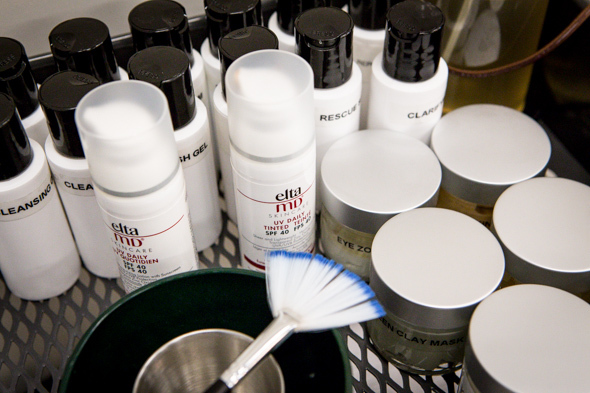 The basics of a facial are generally the same across all spas: cleanse, exfoliate, mask, tone, serum and moisturize. Which, with good products and a fair amount of time alone you could always do at home. But there's a luxury to lying back and having someone do it for you.